Discover Antarctica with this mini study that centers around polar explorer, Sir Ernest Shackleton, the disastrous 1914 expedition of the Endurance to the Antarctic, and the incredible story of survival and heroism of Shackleton and his crew. Preview the information and video (1:15 min.) on the Shackleton100 home page to get an overview of what will be learned. Use the interactive timeline in the center of the page to learn more and see images and short video presentations of the events surrounding the Endurance expedition. Select the Shackleton link in the upper menu. Watch the Sir Ernest Shackleton video (2:28 min.) and read through the text to learn about the life of Ernest Shackleton. Select the Mission link in the upper menu. Read through the information. Do the Crossword puzzle in theMini Study: Expedition to Antarctica - Sir Ernest Shackleton Activity Packet using what you have discovered on the Shackleton and Mission pages of the website. Select the Endurance link in the upper menu. View the timeline video (0:15 sec.) at the top of this page then read through the information. Complete the Cryptograms in the Mini Study: Expedition to Antarctica - Sir Ernest Shackleton Activity Packet . Select the Crew link in the upper menu. Watch the video presentation of the crew (1:25 min.) then do the Word Search puzzle in the Mini Study: Expedition to Antarctica - Sir Ernest Shackleton Activity Packet . Create a timeline of Shackleton's life or the events of the Endurance expedition. Select the Antarctica link in the upper menu. Once the map loads, watch the Antarctica Video by clicking the image on the map to learn more about the continent (1:47 min.) While watching the video, answer the Antarctica Geography Questions in Mini Study: Expedition to Antarctica - Sir Ernest Shackleton Activity Packet , then use other resources to define the geographic terms listed. As you explore the locations on the map, Use the Match It worksheets in the Mini Study: Expedition to Antarctica - Sir Ernest Shackleton Activity Packet to match the location to the image. Print out the map of Antarctica in the Mini Study: Expedition to Antarctica - Sir Ernest Shackleton Activity Packet and mark the locations listed on the map. Write a summary biography about the life of Ernest Shackleton. Pretend that you are one of the crew members aboard the Endurance and write an imaginary journal entry about your experience. Create a newspaper article about what happened to the Endurance and its crew. Be sure to answer the who, what, when, where, and how questions. We have included a blank newspaper template in the Mini Study: Expedition to Antarctica - Sir Ernest Shackleton Activity Packet . 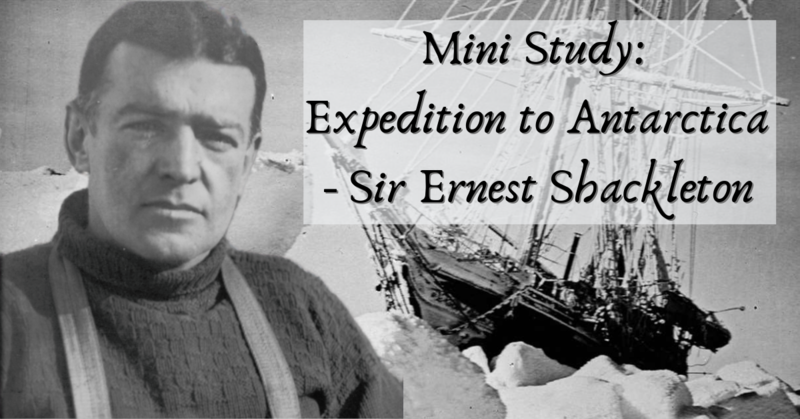 • Older Kids: Do the Convert Temperature worksheet in the Mini Study: Expedition to Antarctica - Sir Ernest Shackleton Activity Packet . • Younger kids: Do the Color the Temperature worksheet in the Mini Study: Expedition to Antarctica - Sir Ernest Shackleton Activity Packet . • Do the Melting Ice Experiment located on The Chaos and the Clutter blog. There is a free Science Lab Sheet in the Mini Study: Expedition to Antarctica - Sir Ernest Shackleton Activity Packet to use to record information from your experiments. • Visit the Gulf of Maine Research Institute website to examine the changes in the ice sheets. There are also suggested activities at this site. • Play the "Science Adventures in Antarctica" printable board game found on Ellen McHenry's Basement Workshop website. • ANDRILL's Antarctica's Climate Secrets – Free downloadable activity book that includes information, images, and hands-on activities and experiments. • Sir Ernest Henry Shackleton – Website created and maintained by members of the Shackleton family. Includes biography, images, book suggestions (mostly an adult reading list), video suggestions as well as links to other recommended websites. • Project Gutenberg: South! The Story of Shackleton's Last Expedition, 1914-1917 – Downloadable version of book written by Sir Ernest Shackleton. • LibroVox: South! The Story of Shackleton's Last Expedition, 1914-1917 – Audio version of book by Sir Ernest Shackleton. * As always, please be sure to preview all of the suggested resources to be sure they are appropriate for your family.